Functional and fun – that is what Anthea Lawrence wanted her kitchen and laundry to be. 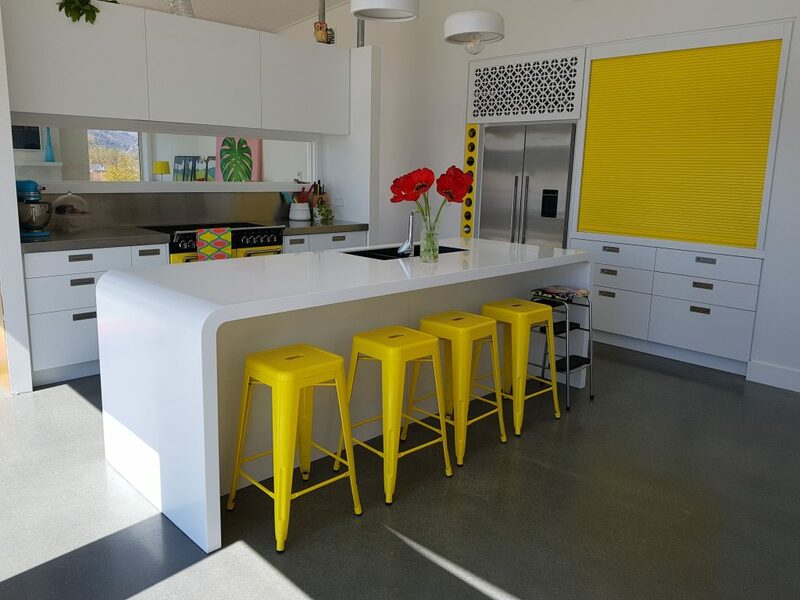 Besides the bright pops of colour, this kitchen that was built by Chelsea and installed by Trevor and Brendon holds a few other surprises. Laminex chalk acrylic benchtop with two waterfall ends. Painted appliance garage with roller door. Painted front on wine rack. Framed door with powder coated steel panelling from AE Tilley. Handles routered in flush to joinery for a clean, modern look. Formica bench in the laundry room. MDF stairs clad in American white oak, clear lacquered, with led strip lighting under treads.